Thank you for joining me as we count down to the next MFT release. We are five days away from the big day! All the new Stamps, Die-namics, and Stencils will be available on Tuesday, October 6 at 10:00pm EST. Be sure to check out the MFT Blog to see all the new items being revealed today. Don't forget to leave a comment on the MFT Blog countdown posts, YOU could win one of the five $75.00 gift vouchers. I have two cards to share with you today, they both feature the new Trim the Tree stamp set and Trim the Tree Die-namics from Lisa Johnson's new line. I have seriously fallen in love with this set. For this first card, I stamped the tress in Limelight, Summer Splash, and Wild Wisteria Premium Dye Ink. I used the MISTI to ensure the impressions were clean and crisp. I then die-cut the images with the Trim the Tree Die-namics. 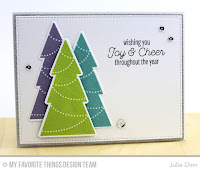 One of my favourite things about the Trim the Tree stamp set is the fabulous sentiments. I just love the mix of fonts. I stamped this sentiment in Black Licorice Hybrid Ink and I finished off the card with a few sequins. I used the same three colours of ink, Limelight, Summer Splash, and Wild Wisteria on this card. I arranged all the elements on a Radial Stitched Circle. How fun is that new die? I love the variation on the regular stitch. Once again, I finished off the card with a few sequins. 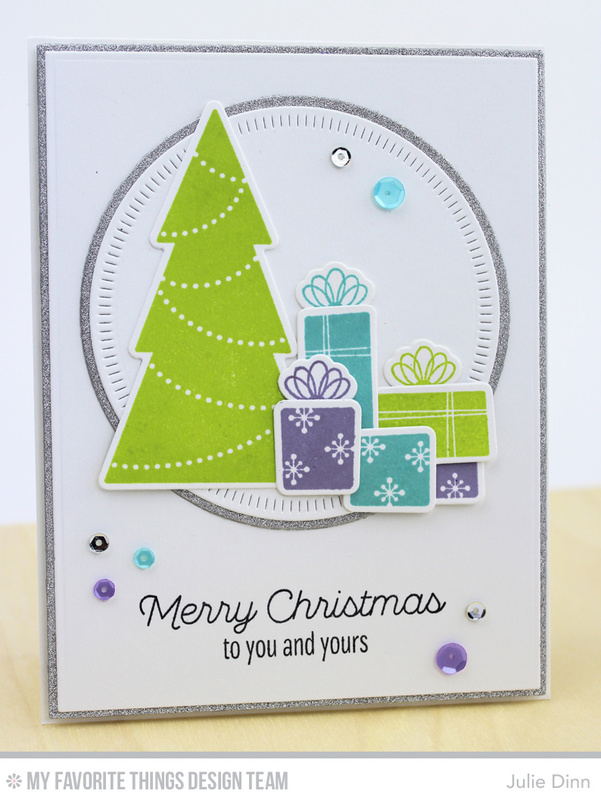 Love the tree stamps and dies. Great design. Love your trendy color combo--so pretty! Great combination of Christmas tree colors! Cute cards! The new ink colors are wonderful. Thanks for sharing! Love the nontraditional color scheme! so pretty- loving these colors!! Great colors for a cheery Christmas cards! so clean, so beautiful cards! I really like your lay-outs, Julie.